While others offer scary predictions about the future of our planet, Scouts and Venturers do something to ensure those dire warnings never come true. In short, Scouts, Venturers and Scout leaders strive to leave this planet better than they found it. It’s been that way since the days of Ernest Thompson Seton, the first Chief Scout of the BSA and a nationally known conservationist. The best tool in your arsenal of environmental stewardship is the second edition of the Conservation Handbook. The $3.99 book is available at ScoutStuff.org. Inside the spiral-bound, 144-page book, you’ll find both the whys and hows of conservation. But first the who. Who is the target audience of the Conservation Handbook? Scouts, Scout leaders, parents, park rangers, land managers and anyone else who is passionate about protecting Earth’s resources. The Conservation Handbook is the work of Robert Birkby, a lifelong Scouter, Eagle Scout, adventure guide, author, photographer, speaker and trail designer. Birkby also penned the first edition of the Conservation Handbook (seen at right), which was released in 1991. In 2010, Birkby earned the BSA’s highest award for conservation: the William T. Hornaday Gold Award. He’s also the author of the 10th and 11th editions of the Boy Scout Handbook and a contributor to Scouting magazine. From the earliest days of the Boy Scouts of America, Scouts have helped to protect Earth’s resources from harm and repair them where damage has been done. Scouts have done their best to learn about nature, understand the environment and see their place in it. A chapter on the history of conservation and Scouting offers a fascinating look back. The chapter includes names you know — Seton, Daniel Carter Beard and William T. Hornaday — and names you don’t, like First Class Scout George Salak of Racine, Wis. In 1915, Salak wrote the BSA to question the wisdom of a requirement in the Pioneering merit badge. The requirement asked Scouts to complete a pioneering project after felling a tree with a diameter of at least 9 inches. Cutting down trees? Not very conservation-minded. “Can you imagine what a tremendous destruction of trees would result if each of these boys were possessed with a desire to fell one tree apiece?” Salak wrote. The BSA quickly changed the requirement. 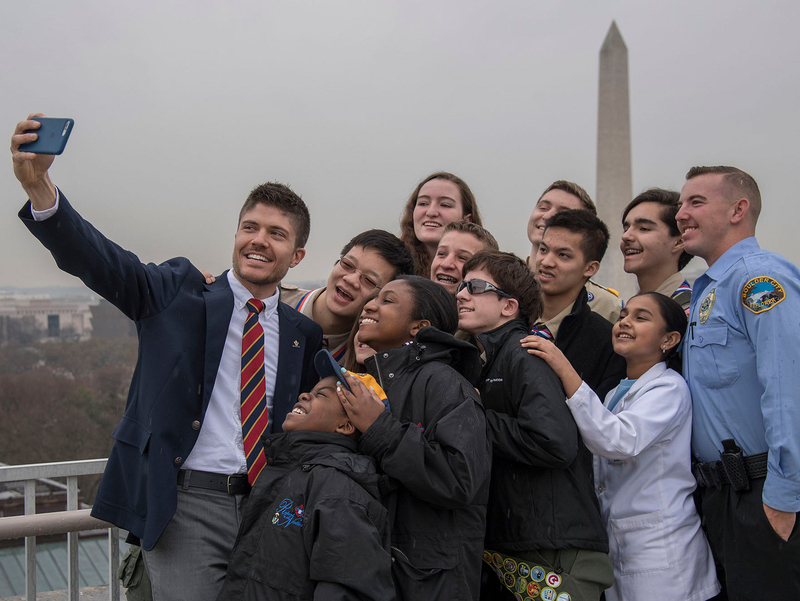 Even today, the Boy Scouts of America has shown its willingness to present “the most current understanding of environmental awareness and being willing to change when better methods come along,” Birkby writes. Once you’ve read Part 1, you’re going to want to do something. To put words into action. To make a positive impact on this planet. That’s what Part 2 is for. The Conservation Handbook is an instruction manual for the Earth. Use it as a tool to help young people become enthusiastic stewards of the land.